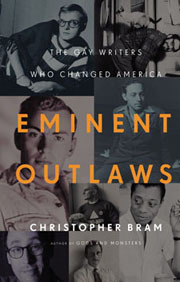 In Eminent Outlaws, Bram charts the growing impact of gay writers after World War II, beginning with the publication of Vidal’s The City and the Pillar and Capote’s Other Voices, Other Rooms in 1948. In an amiable, opinionated literary and social history, Bram steers his narrative through six momentous decades, seeking connections between gay writers and the ways in which these writers connected with an audience that was coming into fuller political, sexual, and cultural openness. Just as the modern novel came into being to satisfy a growing literate class eager to read about itself, the gay novel exploded in part to meet the demand of a newly galvanized gay readership desperate for stories in which they didn’t have to transpose genders to find themselves. Bram writes about ex-pat novelist Christopher Isherwood, playwright Mart Crowley, the prolific Edmund White, poet James Merrill, and activist/writer Larry Kramer. He examines how gay liberation created a huge new market for books and ideas, and how the AIDS crisis brought early deaths to some writers as it heralded a new literature of tragedy, including Tony Kushner’s landmark Angels in America. Of Bram’s nine novels, the best-known is Gods and Monsters, originally published as Father of Frankenstein and made into an Oscar-winning movie with Ian McKellen in 1998. Raised in Virginia, Bram graduated from the College of William and Mary and has lived in New York since 1978. We met at a diner in Greenwich Village as Bram was on his way to NYU, where he teaches writing. 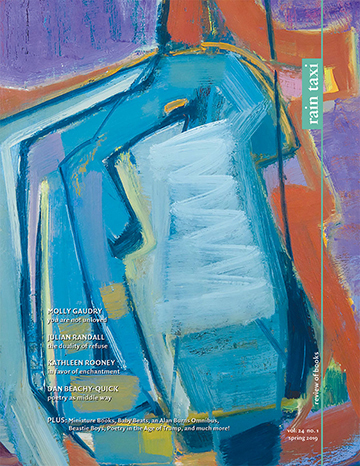 Claude Peck: How long did it take you to research and write Eminent Outlaws? Christopher Bram: I worked on it for two years. When I was done I realized, “My god I’ve been preparing my whole life to write this book.” I read so many of the writers as they were published. The older writers were the writers I read when I first came out myself. I did do research, but a lot of it was connecting dots that I already had in my head. CP: You must have re-read a lot of the books and plays you discuss. CB: I re-read all the books, which was a real pleasure. I worried about that: Will they hold up? And a couple didn’t, but most of them did. Most of them were even better than when I first read them. Then I would fill in the gaps. I read books I meant to read and have never gotten to. A couple of books I hadn’t read because I found them chores and I forced myself to read them and I’m glad I did. CP: What books were a chore? CB: Caracole, by Edmund White. It’s his adult fairy-tale straight novel. And written in this very mannered prose. It’s always pretty, and it doesn’t go anywhere. Very few people finish it. It’s famous now for ending White’s friendship with Susan Sontag, who appears as a character in it. Hats off to White for trying it. It’s an experiment that didn’t work. CP: How did you cover all this ground—six decades, more than a dozen major writers—in such a relatively short book? CB: I knew from the beginning I would not be doing an all-inclusive history of gay men’s literature. I didn’t want to do an index-card narrative. I stuck to those writers I needed to tell the story. Writer A would lead to writer B would lead to writer C. And I just let that naturally unfold. CP: Were you surprised by the tone of some of the negative reviews given to gay writers, even in such well-established publications as Harper’s, the New York Times and the New York Review of Books? CB: Some of them were quite brutal. It was amazing how ugly they could be, how condescending and contemptuous. And from people that you would expect better of—I mean Philip Roth attacking Edward Albee with a phrase like “pansy rhetoric,” Elizabeth Hardwick being very condescending toward Christopher Isherwood’s novel A Single Man. They were creatures of their time, and that could not help express itself in these reviews. Some of them were just plain poisonous. And the editors had no problem with that. CP: Did you find it easier writing about the dead writers, or the living ones? CB: I found it easier writing about the dead writers. The first half of the book is almost all dead writers. I was able to discover my tone for the book there, without worrying about running into them on the street. In the second half I was dealing with several writers who I do actually run into on the street sometimes. Larry Kramer lives on 5th Avenue and I walk from my office to NYU right past there. I will encounter him from time to time, to say hi and speak. Whatever I say about Larry, many worse things have been said of him. CP: You assert that a gay writer must be free to use gay content in his work in order to fully succeed. Is this always true? One thinks of great works by Albee, and even Capote, with no gay content, and one also can recall plenty of unsuccessful books with gay content. CB: Capote has gay themes right up front in Other Voices, Other Rooms, and then he was secretive about it, or just quiet about it. Because of his persona, because he was very effeminate, everyone just assumed he was gay, and he knew that. At a certain point it began to block him. He didn’t know how to express the gay side of himself well. There’s a chapter in his unfinished novel, Answered Prayers, that is very gay—it’s the gayest thing he ever wrote, and it’s awful. In a way it’s fascinating, but it’s this ugly, mean portrait of Tennessee Williams. And it’s painful to read, because Capote is a much better writer than this. One person who has successfully sublimated and continued to do great work is Edward Albee. He keeps the gay card close to his chest. Yet he probably got attacked more brutally than most of the other writers I talk about, not for writing about being gay, but simply for being gay. Who’s Afraid of Virginia Woolf is a great play, and critics recognized that, but then it was like this homosexual panic crept into the theater world. They became really nervous over the fact that the great American playwrights were O’Neill, Miller, Williams, and Albee, and two of them were gay, and they thought, what does this say about us? It took them a while to get over that. CP: You write more about Gore Vidal than any other writer. Yet the majority of his writing—his big historical novels—are not what you would call “gay books.” Why so much about Vidal? CB: Partly it’s a matter of timing. Vidal was present at the creation, and he’s still around. He made a great through-line for the narrative. It was also kind of interesting tracking his zig-zagging back and forth. He wrote one of the first openly gay novels, The City and the Pillar, and then he kind of backed away from that as a subject, for years, then he came back to it with Myra Breckinridge [in 1968], then he backed away again. Along the way he would write these essays. He’s a great essayist—smart, funny, erudite, surprising. Some of the most important statements about gay sexuality and about sexuality, period, in America, were made by Vidal. His essay “Pink Triangle, Yellow Star” is a very important work, and still very readable. CP: Is James Baldwin to be remembered more for his novels or his many nonfiction essays and his connections with civil rights? CB: Baldwin’s fiction is better than his essays, by and large. I think he’s an amazing writer and an amazing person. Early on he’s the angry black man, he was kind of seen that way by both black and white friends in the ’50s, then the Black Power movement got started in the ’60s, and he’s treated as a sort of Uncle Tom, which was absolutely ridiculous. One of the ugliest anti-gay pieces I read was Eldridge Cleaver’s Soul on Ice and his attack on Baldwin. What’s shocking there is the white literary establishment bought it. They believed Cleaver. This nutcase. I mean Cleaver went on to become a born-again Christian and then a Republican. They bought it, and it really hurt Baldwin’s reputation as a black spokesman. The attack confused him and he never really found his feet after that. He kind of tried to deal with it with the novel, Tell Me How Long the Train’s Been Gone, where a character like Baldwin becomes friends with a black radical a little bit like Eldridge Cleaver, but it doesn’t really work. He never really found quite the right response. CP: New York is the backdrop of much of your book. New York-centricity? CB: New York has always functioned as a sort of a cultural magnet. In the 1960s, ’70s and ’80s it functioned as a sexual magnet. Whether you were literary or not, gay men would come here to explore who they were. Here or San Francisco. That brought a lot of energy. It also was the publishing capital of the U.S. I came to New York from Virginia in ’78, telling myself all writers need to live in NY at one time or another. I’ll meet people, I can network. Under that, I wanted to get laid. I wanted to meet other gay people. Luckily now, with the Internet, and the opening of gay life in general, you don’t have to come to New York to be gay, or to be published. You can stay where you are. CP: You say gay writing “played a larger role for us than it did for the civil-rights movement or even the women’s movement.” Why? CB: Reading is kind of a secret activity, as is being gay. It’s a very private activity, whereas race is much more public, and you don’t need the private act of reading to feed your awareness, or enable you to find community. The women’s movement is closer to the gay community model. There were some important women’s novels in the ’60s and ’70s, that were eye-opening, but not as often as in gay fiction. CP: Some people think the generational shift has brought in a post-gay era, where old communities and distinctions are fading. If that’s true, is it good or bad for gay literature? CB: I don’t understand the whole post-gay thing. It’s more a matter of degree than kind. Gore Vidal was a proponent of post-gay back in the 1960s. He said there’s no such thing as a homosexual, homosexual is an adjective, not a noun. Everyone is bisexual, and there’s no such thing as a gay identity. There’s always been that desire to break out of the box, to say categories only get in the way. How all this impinges on the literature now. . . . It’s a transition time. Nobody knows who wants to read what and how to sell it. Publishers are backing away from gay books, but they’re backing away from all mid-list books. They’re trying to appeal to as many people as possible. There are still terrific books being published. To me, the problem now isn’t the post-gay era, it’s the crisis of the mid-list book. Gay books are nothing if not mid-list. Claude Peck is a writer and editor in Minneapolis. He is arts editor of the Star Tribune. 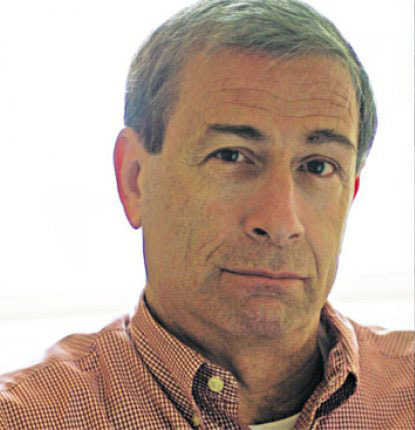 CLICK HERE to see a list of Christopher Bram’s favorite books.